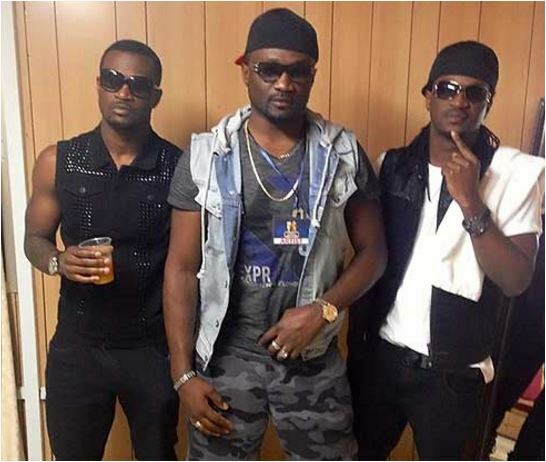 In a new video circulating on social media, the Okoye brothers of Peter and Paul Okoye and their elder brother, Jude were seen nearly punching each other after several verbal abuses. This happened at a mediating session at their lawyer’s office. Earlier, Peter had sent a termination letter to their lawyer Festus Keyamo (SAN), demanding for a termination of the agreement between Psquare. In the letter, he defends his decision by making some serious allegations against his twin Paul and older brother/group manager Jude. He also accused Paul of slandering his wife and children with lies on social media and alleged that they’ve now been receiving threatening messages. Jude, whose wife gave birth to a baby girl Monday, was seen threatening to beat up Peter who was behind the camera while Paul was heard telling Peter, “shame on you.” Hours after the video began to trend online, Paul took to his twitter handle @rudeboypsquare to respond; “Wow!!!! And he finally released the all mighty video lol.” News broke on Monday that the hip-hop twins who have dominated the Nigerian music scene for many years, had split up following a letter sent by Peter to their lawyer, Festus Keyamo (SAN). Peter demanded for a termination of the agreement as a group based on serious allegations against his twin Paul and their elder brother and manager, Jude. He accused Paul of no longer willing to co-operate with him, and even gone as far as cancelling their scheduled music tour to the United States. He added that Paul was also slandering his wife and children with lies on social media, and alleged that his family was being threatened with threat messages. Peter further accused his older brother Jude of once threatening to kill him and shoot his wife Lola. Peter stressed that he was tired of the “drama.” He had gone ahead to perform solo at a show in Philadelphia which he revealed on a Snapchat video. However, his brother and estranged partner, Paul had taken to his instagram page days later to write; “Only a woman can come where there’s peace and destroy it”. The duo had gone their separate ways in 2016, after engaging in similar fight, however, they settled their differences and bought mansions close to each other in 2017.